You should disassemble your reproducer and replace both the inner and outer gaskets. Also remove rust of the reproducer and oil slightly all metal parts. Here is a original manual by the Victor Talking Machine Company from 1914. Be careful with all those tiny parts! 2. Diaphragm not centered, causing it to touch the soundbox cap. 3. 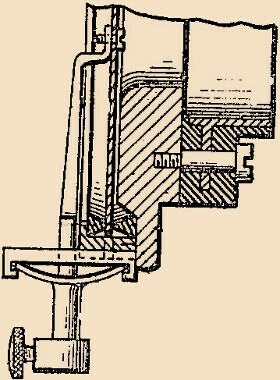 Fulcrum bearings of needle arm not set on fulcrums of the sound-box cap. 4. Needle-arm foot pressing on the diaphragm. 5. 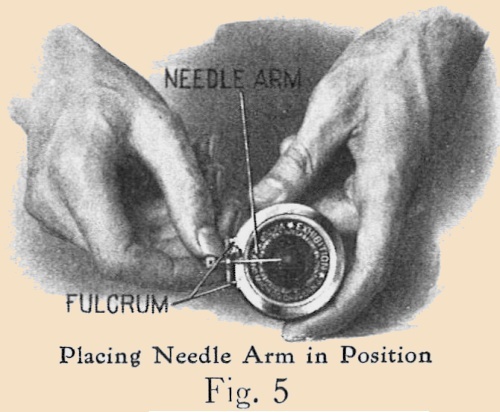 Needle-arm foot pulling on the diaphragm. 6. Needle-arm foot not securely fastened to the diaphragm. 7. Adjusting or lock nuts loose. 2. With the small camel´s hair brush place a little orange shellac around the top of the rubber insulator to hold the diaphragm in position. 4. 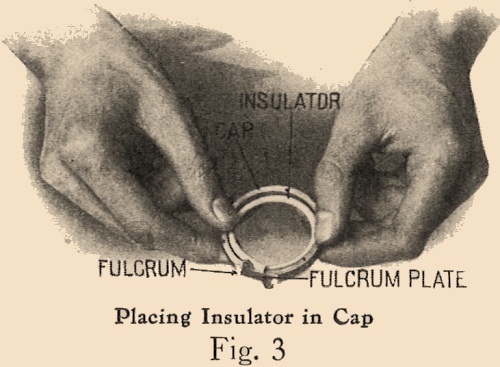 Place the second rubber insulator in position on top of diaphragm with the ends of the insulator exactly opposite the ends of the insulator under the diaphragm. 5. Place the sound box back (Nos. 761 or 578A, Fig. 2) in position, tightening the three small screws (No. 485, Fig. 2) securely in position. 7. With Sound-box arm in position, tighten both sound-box arm screws (No. 496, Fig. 2) sufficiently to bring the needle-arm foot flat on the diaphragm. 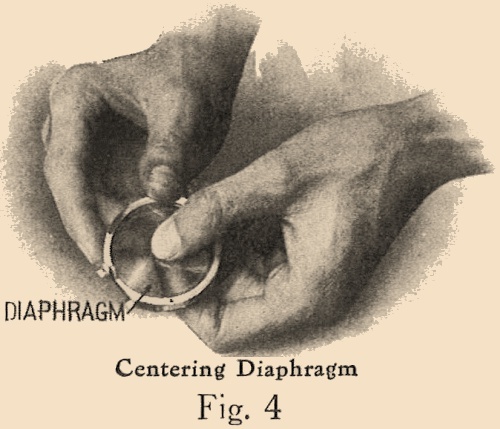 Careful attention should be given to this operation to see that the needle arm does not press tightly on the diaphragm or that it does not stand away from the diaphragm. For proper results the arm should barley touch the diaphragm. This may be accomplished by tightening the upper screw to lower the arm on the diaphragm. 8. 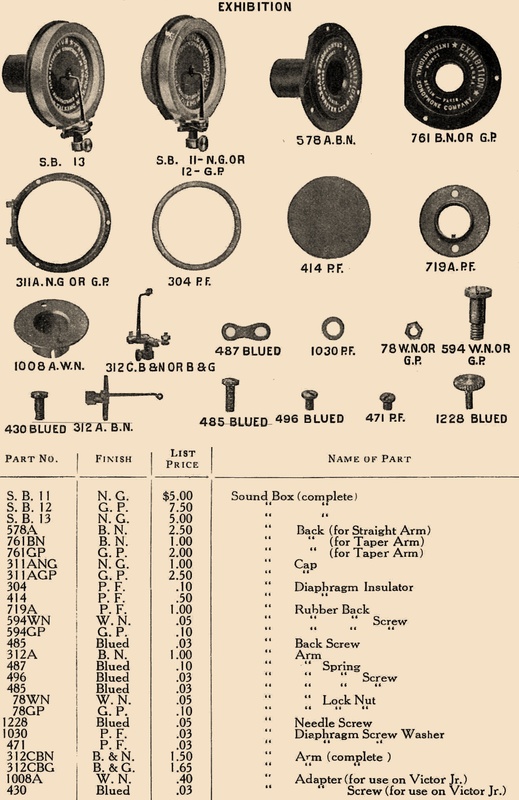 When screws are properly adjusted, tighten the lock-nuts (No. 78, Fig. 2); (see Fig. 6) with tool No. 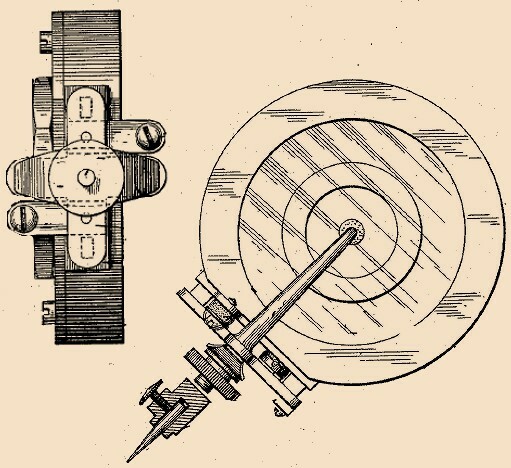 1846 (see Fig. 1) to prevent the adjusting screws (No. 496, Fig. 2) from changing their positions. 10. With the sound box in the same position run a tap, using No. 00-112 standard size, through the diaphragm and needle-arm foot, tapping the diaphragm for the insertion of the diaphragm screw (No. 471, Fig. 2). 11. Place small paper washer (No. 1030, Fig. 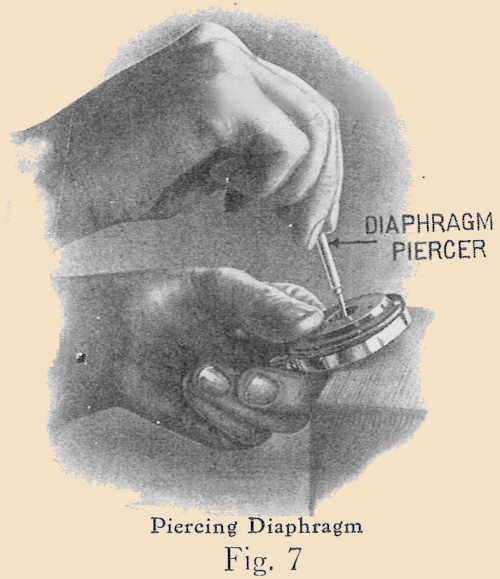 2) on the diaphragm connection screw, and with the sound box in the same position insert the diaphragm connecting screw and tighten securely. 13. If taper arm sound box, place the rubber back (No. 719A, Fig. 2) in position. 14. 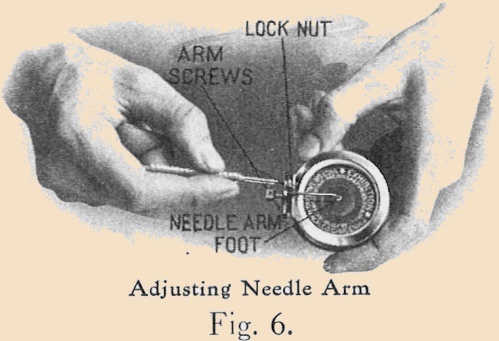 Place the needle-arm thumb screw (No. 1228, Fig. 2) in arm. 15. Test carefully for proper adjestment by playing a record with which you are familiar, If the tone of sound box is heavy, relieve the pressure by slightly releasing the upper screw (No. 496, Fig. 2). It requires but half a turn sometimes to accomplish the desired results. If the sound box rattles, try tightening the upper screw slightly. 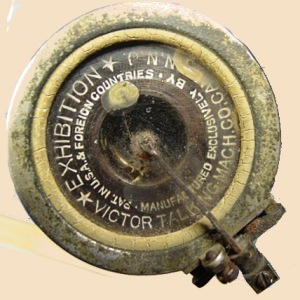 the wishes of the Victor Talking Machine Company. 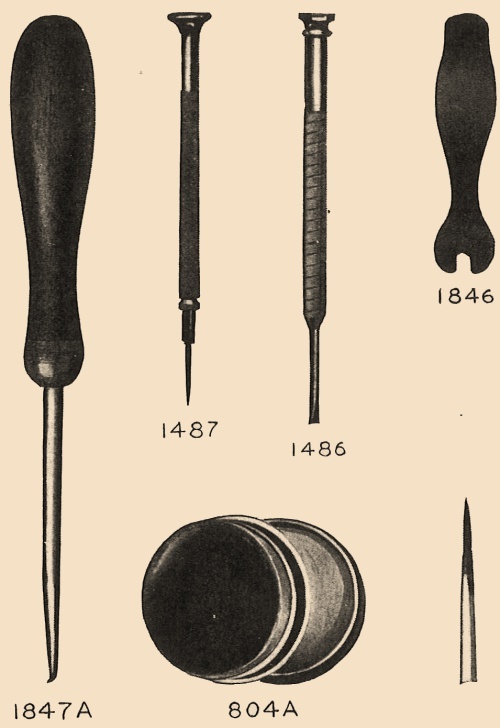 * Do not poke at the mica diaphragm with your finger or with a sharp implement. It is tough and durable, but may be injured through abuse. * Do not leave the sound box down on the turntable when your Victrola is not in use. Turn it back onto the sound box rest. * Do not drop the sound box onto the record. When starting to play, lower the sound box gently. 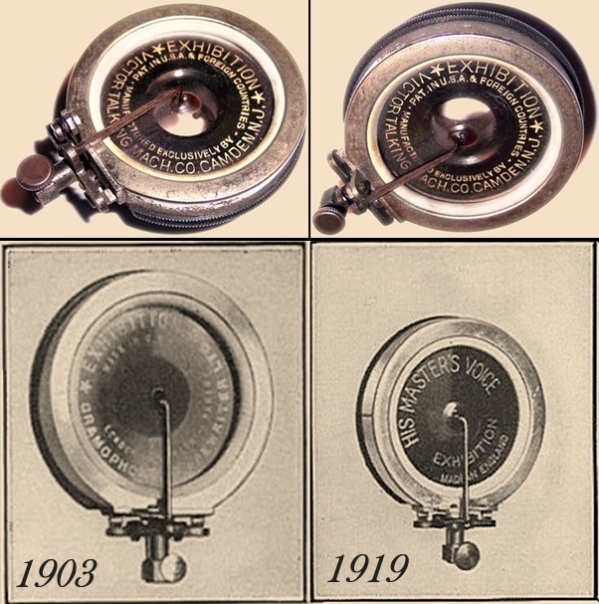 * A loose needle is a frequent cause of a noisy sound box, hence if your Victrola reproduces improperly see that the needle is securely fastened in its holder. * If you are using steel needles, put in a new needle after every record. 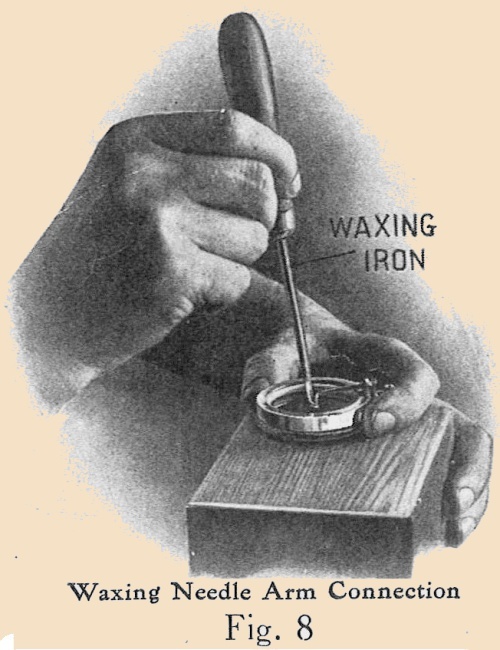 Using a steel needle more than once injures the record. Use needles only once with a phonograph record!